Dr. Kyle C. Kopko earned his Ph.D. in political science from The Ohio State University in 2010, with a concentration in judicial politics and American politics. 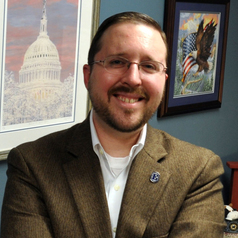 He currently serves as Assistant Dean for Academic Achievement and Engagement, Associate Professor of Political Science, and Director of the Honors and Pre-Law Programs at Elizabethtown College in Pennsylvania. Dr. Kopko's research has earned him international recognition as an expert on vice presidential candidates, partisanship, and the federal judiciary. His research has been published in a variety of peer-reviewed outlets, including Election Law Journal, Judicature, Justice System Journal, Political Behavior, and Presidential Studies Quarterly. He is co-author of the book “The VP Advantage: How Running Mates Influence Home State Voting in Presidential Elections,” (Manchester University Press) with Dr. Christopher Devine. Dr. Kopko’s research has been featured in numerous media outlets, including The Wall Street Journal, The Washington Post, The New York Times, The Chicago Tribune, the Los Angeles Times, U.S. News & World Report, FiveThirtyEight, The Huffington Post, the Canadian Broadcasting Corporation, and Fox News Channel.